Confused Soul: CHAK DE INDIA!!! 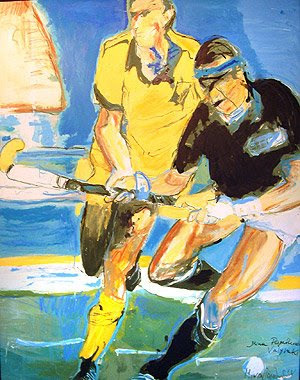 This is the story of golden journey (at least till 1980 it was golden) of INDIAN HOCKEY in Olympics... time passes and we slipped from Gold to fifth, sixth, seventh, eighth and finally could not even qualify :( Eleventh place at the World Cup, no medals in the 2006 Commonwealth and Asian Games and a failure to qualify for Olympics for the first time in the history of the games were some of the shockers that came to the Indian Hockey in recent past. Who is responsible for this all; Indian Hockey Federation, players, decreasing popularity of Hockey or increasing craze for Cricket? Even after one of the biggest bollywood hit of 2007 “CHAK DE INDIA”, which is solely based on indian women’s hockey, the women hockey team met the same fate as men’s; failed to qualify for Olympics… The movie, which has revived the state of many games (remember, India has won 20-20 world cup in cricket after shameful performance in 2008 ODI world cup just after this movie) and gave India is new sport anthem “Chak de India!! !” couldn’t do any wonder for Indian Hockey, which it was targeted to. Though a come back performance in Azlan Shah Hockey tournament gave a sigh of relief but it is not enough. India has to perform at bigger stages to regain its lost pride in world hockey. So what is the reason for all this? If we look back then we can see that a dictator is in the centre of this all; KPS gill has acquired the IHF chief post almost 15 years back and the downfall of Indian Hockey has begun around that time frame. Under KPS Gill, Indian hockey plunged to new lows. More than 15 coaches were sacked, incidents of violence in domestic hockey saw a rise and performance on the field was shocking to say the least. And that was not enough; IHF secretary, Jothikumaran, was caught on camera taking a bribe to induct a player into the team. Finally, IOA (Indian Olympic Association) opened its eyes and sacked Mr. KPS Gill and Jothikumaran to save Indian Hockey. Not only this, it suspended IHF and appointed a new 5 members committee to take care of Indian Hockey. Actually, I’m not sure whether IOA took this step willingly or under the threat of International Hockey Federation, which threatened to take away India’s right to host the 2010 World Cup unless stern action was taken. Nice Article!.... really, anyhow indian hockey has to bring back its fame, so that we can feel proud in saying HOCKEY IS OUR NATIONAL GAME. Nicely composed. I too share similar feelings abt the state of Indian hockey and that it is high time govt or the IHF to bring back India to its winnind days. May be, we can contribute as well, though in a small way, by at least talking abt Hockey once in while, for a change at least. Let's see India doing a "Chak De" in Hockey as well.